Are you a guns and ammos type of hobbyist? If you are, then you surely understand the need for one to have the best reloading benches in the market. And even if you are not that adept in terms of skills or you are just starting out on the art reloading bullets, everyone deserves to have the best and the most reliable work stations to ensure top notch results every single time. A reloading bench’s top most reason for existence is to provide ample and a sturdy workspace for the purpose of reloading, storing and changing ammunition to different, yet useful forms. A good reloading bench will provide not just a table to work and complete ammunition related projects, but to also provide enough storage space for tools and other materials. This type of bench also helps keeps a re-loader maintain a safe and organized working environment. We want to make sure that you choose the right one for you, that is why we tested and reviewed 3 of the most popular ones in the market today. So, let’s get started! Seville Classics Ultra HD Lighted Workbench – made of durable 1 and ½ inch thick beech wood, the Seville classics is definitely a bench that is worth considering. One thing that is also worth mentioning is that it sports a metal frame. The legs are skid or slip proof because the bottoms are rubberized. And while we are in the topic of legs, the feet are adjustable as well to make sure that you will be able to raise the workbench to your preferred height. It can be moved from one place to another which means that you can clear out your workroom or garage in a cinch. Lee Precision Reloading Stand – made entirely of steel, this is considered to be a really durable reloading bench. The legs are lined with rubber to avoid slippage even against carpeted or tiled floors. Because the Lee Precision stands on 3 legs, you can be sure that it is stable yet movable at the same time. Hopkins 90164 2×4 Basics Workbench Shelving – when it comes to durability and stability, Hopkins is definitely one that comes with loads of recommendations. Made of heavy-duty resin, the legs and other components are stable and reliable. It is solvent resistant, so in case you spill chemicals, you can be sure that the workbench will stay intact. They are also impact resistant. What we like about this is that you can load up to 1,000 lbs. worth of tools and equipment and you will never feel it budge. The only thing that we would like to stress out is that it doesn’t come with the 2×4’s and the ply wood that you can install or attach the legs and supports on. These you have to buy separately. So it is important to choose the best types of materials to make sure that you do not get into any accidents or buy replacements constantly. Lee Precision Reloading Stand – this is designed for workspaces of different sizes, so even if you have very limited work area, you don’t really need to worry about where to place this or if you have enough room to reload your cartridges. Lee’s patented, quick change bench plate could accommodate different kinds of metallic presses, which you can easily attach to its pre-drilled steel-base block. The stand comes with a steel shelf for your extra bits and presses and other mountable accoutrements. There is also a small storage bin or basket which you can clip or attach to the steel leg. Hopkins 90164 2×4 Basics Workbench Shelving – this is definitely one of the most customizable types of work benches. The Hopkins Basics Workbench is easy to assemble and can be laid out depending on the size and purpose that you prefer. You can assemble a bench that is 8 feet in height and 4 feet in width or you can go larger and wider because it all depends on your need. It is designed for you not to have a hard time assembling because it requires a few tools ( a saw and a screwdriver). You simply need to make sure that you follow the instructions carefully and you will have a well-built bench. You can attach shelves or extend an already existing work bench with this set. 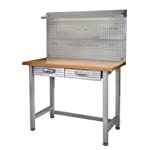 Seville Classics Ultra HD Lighted Workbench – the Seville Classics is ingeniously designed all because you get a large pegboard which comes with a 23-hook set. This is customizable, meaning you can easily move the hooks around depending on the type of tools that you wish to hang or organize. It also comes with 2 metal drawers which are cushioned keep your tools from moving around, bumping against each other or scratching the coating of the drawers. Cantilever shelves are also worth considering. Now, because the layout and the design is well-thought out, you will enjoy working even at night with the bench’s built-in fluorescent lighting. The bench is also just the right size to fit even a medium sized garage. The worktable itself is 24 inches wide, which gives you enough room for installing your case prep center or your reloading equipment. Hopkins 90164 2×4 Basics Workbench Shelving – it seems that there is no limit on what you can do with this bench. Be it working outdoors or indoors, you can easily do so just as long as you have properly assembled it. Being a customizable workbench, you can do all your reloading projects here. But you better use a sturdy or a durable type of wood to avoid any mishaps. Seville Classics Ultra HD Lighted Workbench – this is a really versatile type of workbench because the Seville Classics is built to support almost every type of hobby or skill. Whether you enjoy reloading and reworking ammunition or you are into blacksmithing, fixing electricals or doing lots of wood work, you can easily customize this workbench to match your skills or tasks. Lee Precision Reloading Stand – while the Lee Precision reloading stand is not your all around workbench, it does serve the purpose of why it was built in the first place. We found this really customizable since the legs are accessory ready. You can attach bin brackets for additional baskets, racks and shelves through the mounting holes on the legs. Again, this stand is specifically for reloading casings. So if you wish to install a case prep or a reloading press, you may easily do so. But if you want to make other things using your cartridges or you wish to work on guns, arrows and other hunting related projects, we advise you to look for a larger or a more versatile workbench. Out of the three that we have tested and reviewed, the Seville Classics Ultra HD Lighted Workbench gets our votes. This is considered to be the best of the best reloading benches that you can find simply because it met all three of our important criteria. Of course, you can go for the Lee Precision Reloading Stand if you really want something specific for reloading. It is well-built and can easily be moved from one place to another.